I also noted that it seemed weird to have this fight in March with seemingly not enough time to drum up promotional interest. Well, thatÃ¢â‚¬â„¢s not a problem anymore. Either the fight gets moved back or bumped entirely, or thereÃ¢â‚¬â„¢s enough steroid talk in three months to carry us through. I like Pacquiao a great deal, and I donÃ¢â‚¬â„¢t think he uses steroids. I admit that I have nothing to back that up. When it comes down to it, itÃ¢â‚¬â„¢s sort of the same as with Lance Armstrong, where I think heÃ¢â‚¬â„¢s so good for his sport and his fans that I donÃ¢â‚¬â„¢t want to believe he could be doing it, even if it would make sense that he was. But when Pacquiao refuses MayweatherÃ¢â‚¬â„¢s demand of random Olympic-style drug testing, it opens him up to all sorts of accusations and criticism. Does Mayweather think PacquiaoÃ¢â‚¬â„¢s on PEDÃ¢â‚¬â„¢s? Maybe he does, maybe he doesnÃ¢â‚¬â„¢t; there are a lot of people who do, including my boy Paulie Malignaggi, citing MannyÃ¢â‚¬â„¢s ability to rocket up in weight class while maintaining the same punching power and physique, and to take, for example, CottoÃ¢â‚¬â„¢s biggest shots and stand in there. But why should Mayweather be able to stipulate what drug testing is done here, when fighters for Vegas fights are always tested the same way? A big reason that PacquiaoÃ¢â‚¬â„¢s people donÃ¢â‚¬â„¢t want to simply accede to this demand is that they donÃ¢â‚¬â„¢t want to jump every time Floyd says frog. 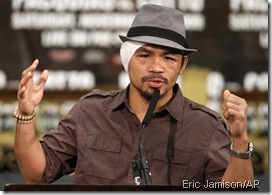 Pacquiao stood in there with Cotto; I think he can handle a needle, regardless of what Bob Arum says. But they canÃ¢â‚¬â„¢t handle Floyd calling the shots and dictating that Manny submit to a testing process that has never been used, to my knowledge. Manny has passed every test that boxing has required not just of him, but of every fighter. This would be equivalent to getting searched without a warrant. 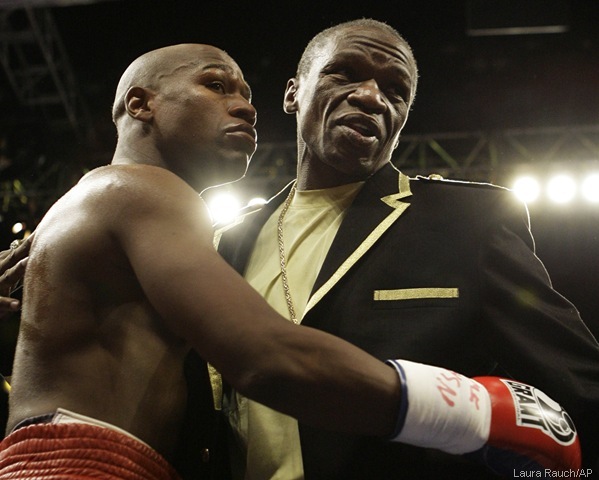 And heÃ¢â‚¬â„¢s indicated that heÃ¢â‚¬â„¢s concerned that itÃ¢â‚¬â„¢s going to happen the night before the fight. And yes, I understand that Manny asked for a somewhat excessive stipulation of a $10 million penalty on Mayweather for every pound he weighs in over the limit. But at least thereÃ¢â‚¬â„¢s precedent: Juan Manuel Marquez came up two classes to the heaviest heÃ¢â‚¬â„¢d ever been to fight Floyd, and Floyd didnÃ¢â‚¬â„¢t even attempt to make weight. To drop those two extra pounds constitutes a tax on the body, one which Mayweather had no interest in paying Ã¢â‚¬â€œ not when he didnÃ¢â‚¬â„¢t have to. Marquez wasnÃ¢â‚¬â„¢t bowing out of a $2 million payday, the highest of his career. And shouldnÃ¢â‚¬â„¢t Pacquiao make sure Floyd makes weight so that Manny doesnÃ¢â‚¬â„¢t have to be the heavy and drop out of a fight everyone wants to see? 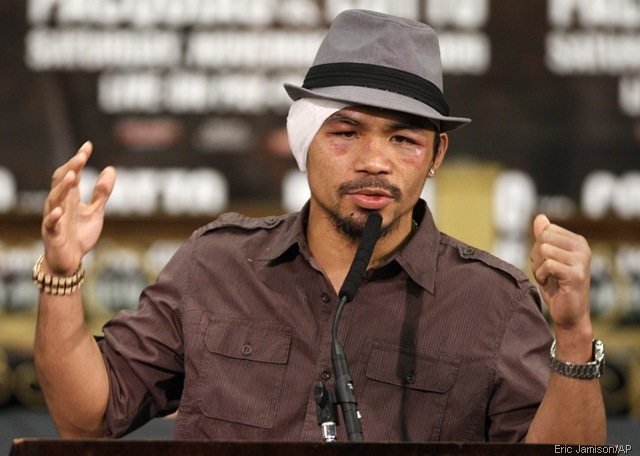 Anyway, thereÃ¢â‚¬â„¢s no precedent except hearsay and blind speculation to make accusations that Pacquiao is on something. I understand that itÃ¢â‚¬â„¢s possible to beat nearly any drug test, but why should he be under any more scrutiny than Floyd himself, who in the past four years has jumped from 135 to 154 seamlessly? As people are starting to notice, their career trajectory is markedly similar, and yet nobody has ever accused PBF of juicing. 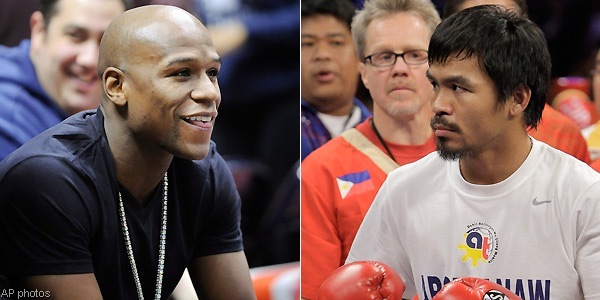 The thing is, if Manny pulls out, which his camp has threatened, everyone just pretty much assumes heÃ¢â‚¬â„¢s on something. ThatÃ¢â‚¬â„¢s the genius of what Floyd did. When youÃ¢â‚¬â„¢re accused of this, it doesnÃ¢â‚¬â„¢t really matter if you did it or not, it simply hangs over your head regardless. That is the culture that has been created. There will always be that element that believes, for example, that Albert Pujols is on steroids, whether he is or not. ItÃ¢â‚¬â„¢s hard to say those people are wrong. Who in sports can you take at their word, after so many have blatantly lied about never having used PEDs? Nobody, thatÃ¢â‚¬â„¢s who. So the buzzards immediately began circulating around Manny, who had been nearly universally beloved not too long before that. Pacquiao has offered the compromise of having his blood drawn in January and then immediately after the fight, but Team Mayweather isnÃ¢â‚¬â„¢t having it, citing that it would be dangerous for Floyd to be in the ring with someone on illegal supplements, regardless of whether he fails a test after the fightÃ¢â‚¬â„¢s over. And, I guess, if theyÃ¢â‚¬â„¢ve taken it this far already, that actually makes sense in the context of the argument, though itÃ¢â‚¬â„¢s hard to fathom that he would test clean right before a fight but not right after it. Bob Arum has said that this proves that Floyd Mayweather doesnÃ¢â‚¬â„¢t really want the fight and is attempting to torpedo the negotiations. That isnÃ¢â‚¬â„¢t true at all. MayweatherÃ¢â‚¬â„¢s not stupid; he knows he can get more money fighting Pacquiao than he can anyone else, especially if the fight dictates rematches. ItÃ¢â‚¬â„¢s all about getting an advantage. Mayweather is a lot like Michael Jordan in that he wants to have every edge possible. Jordan used to befriend other players around the NBA Ã¢â‚¬â€œ Patrick Ewing and Charles Barkley most notably Ã¢â‚¬â€œ and you were never sure whether he actually liked them, or whether he was simply doing it so that just maybe, their killer instinct would drop an iota. That would be all Jordan would need while he was fixing to rip their hearts out and show it to them. And now he wants PacquiaoÃ¢â‚¬â„¢s mind to be on drug testing rather than solely on training for the fight. Honestly, itÃ¢â‚¬â„¢s a master stroke. I donÃ¢â‚¬â„¢t like what itÃ¢â‚¬â„¢s doing to the purity of the fight, but I respect his tactics. This is some Ã¢â‚¬Å“Art of WarÃ¢â‚¬Â stuff right here. If he doesnÃ¢â‚¬â„¢t take the fight, or fights someone else Ã¢â‚¬â€œ neither of which IÃ¢â‚¬â„¢m telling you is a realistic option Ã¢â‚¬â€œ everyone writes him off as a steroid guy. ItÃ¢â‚¬â„¢ll be like Mark McGwire saying he doesnÃ¢â‚¬â„¢t want to talk about the past. If they compromise in some way, make the testing less random, he still comes off like heÃ¢â‚¬â„¢s hiding something. If he tests clean and loses, people will say he was a figment of science and couldnÃ¢â‚¬â„¢t fight when his blood was tested. Really, the only thing he can do is acquiesce to the testing and then win the fight, which he probably should have tried to do in the first place, though he viewed that proposition as a slight to him. But Floyd has the deck stacked. One thing Arum wasnÃ¢â‚¬â„¢t blowing smoke about in his horrible series of excuses is that Manny is a superstitious guy. If he really feels giving blood Ã¢â‚¬â€œ albeit less blood than a nosebleed Ã¢â‚¬â€œ is going to hurt his performance, then it will. But until they figure something out, more and more people have started to wonder what Manny has to hide. Regardless of whether heÃ¢â‚¬â„¢s taking a stand out of pride, he has to know how this is looking to a skeptical American sports community. ItÃ¢â‚¬â„¢s hard enough to fight Mayweather in the ring. But what Manny Pacquiao is finding out is that itÃ¢â‚¬â„¢s impossible to defeat him in negotiations. Believe me Ã¢â‚¬â€œ the fight will happen. Nobody involved truly wants to leave the biggest money fight ever on the table. And Floyd is coming out way ahead, months and months before they even set foot in the ring.